You planned. You prepped. You pop out of bed and hear a soft pitter patter. You peer out the window and...rain. Your perfect day outside may be postponed, but that’s okay - now you have a Plan B. A rainy day in Traverse City is full of possibilities. That’s enough alliteration about precipitation -- let’s get to the information. Traverse City is a town brimming with bustle and activity all year round, no matter the weather. Here are some ideas to help families have fun on a rainy day. A rainy day is a perfect day to get the creative juices flowing. Dig in and get your hands dirty at Darling Botanical, a unique shop and florist located in the Warehouse Marketplace. Start with a coffee or tea at the adjoining BLK\MRKT coffee shop and then head over to Darling Botanical where you and your kids can build terrariums -- gardens under glass -- at the incredible terrarium bar. 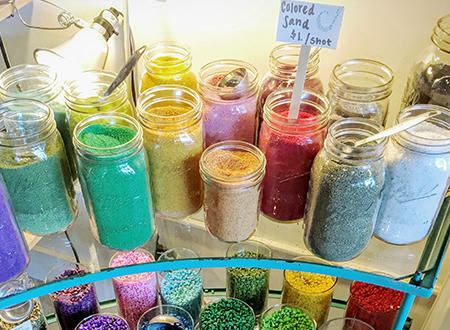 Choose your vessel, fill it with colored sand, miniature toys, small statues and whatever else you dream of and take home a one-of-a-kind souvenir. To keep the inspiration flowing, walk around the corner to Handz on Art, also located in the Warehouse Marketplace. The kids will love staying inside at this paint-your-own pottery studio where they can choose their pottery, paint colors, patterns and more! I know what you’re thinking: "Sure, I like the idea of taking my kids to a museum, but keeping them corralled and quiet in the midst of expensive artwork protected behind red velvet ropes and stanchions is not my idea of fun." Rest easy -- this is Traverse City, not Paris. Your kids (and you) can play, learn and explore at the Great Lakes Children’s Museum or take in some musical history the Music House. And while it doesn’t bill itself as a museum, the Butterfly House and Bug Zoo is a fun and immersive educational experience that can keep your kids engaged for hours on a rainy day. Also, make sure to check out the events and exhibits at the Dennos Museum Center and Crooked Tree Arts Center. Both feature lots of programs for kids. Is there any better way to spend a rainy afternoon than taking in a movie and knocking back some popcorn? The State Theatre and Bijou By the Bay show the best new movies, with state-of-art projection, screen and sound and do so in a classic movie house environment. Best of all, you can take your family of five to the movies and spend more on the parking meter than you do on tickets. Every Saturday at 10 a.m. (and every Tuesday and Thursday, too, in the summer), the State Theatre offers 25 cent admission -- not to mention 1 dollar candy -- for a family-friendly film. All movies, all day, are free over spring break, March 25-31. When our kids have been cooped up inside all morning due to rain, it’s not pretty if we take them out to lunch. Let’s just say you don’t want to be in a booth next to us. Fortunately, you can get the kids fed while keeping them entertained. 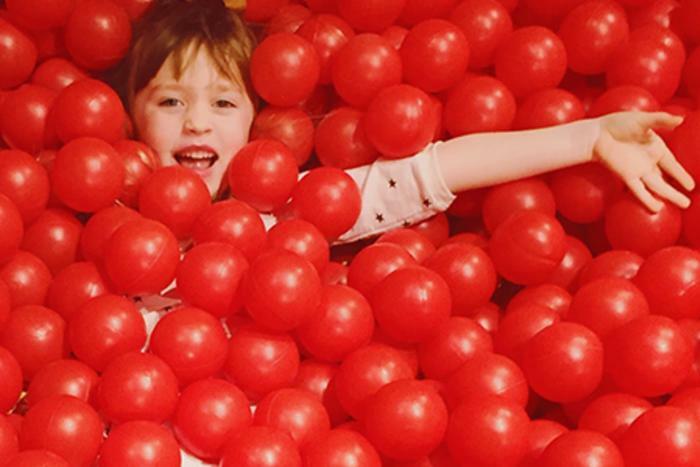 If you’re downtown, pop in at Cherry Republic for lunch and let the kids climb the cherry tree house and bounce around in the bin of red balls. Take advantage of the rainy weather to visit a unique shop on the outskirts of town. Head up the Old Mission Peninsula and step back in time at the Old Mission General Store. Buy some penny candy, grab some groceries or have lunch and ice cream at this 163-year-old establishment. Or take a different route towards Glen Arbor and head west on M-72 where you’ll find Light of Day Organic Farm and Tea Shop, North America’s only organic tea farm. While you are there, enjoy the beautiful farm and then step inside where you can sample a shot of matcha -- which has been dubbed 2016’s hottest beverage for its purported health benefits. The matcha is mixed with pineapple juice and coconut water to make a smoothie shot, so kids of all ages can enjoy. You don’t have to stay inside on a rainy day, right? 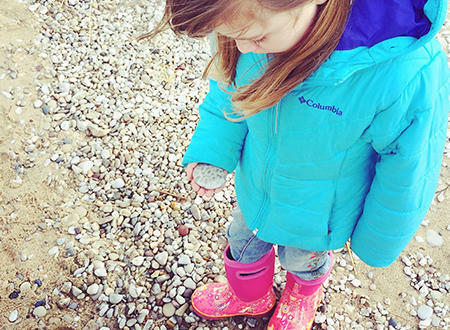 As long as it’s not too wet, head to the beach and hunt for Petoskey stones. They are notoriously hard to find when dry, but a Petoskey stone’s distinctive circles pop out when they get wet making them much easier to discover. Don’t let a little rain stop you from having an awesome day in Traverse City. Always look for the rainbow -- no matter what the weather brings.